Shopping for bedroom furniture can sometimes be a mundane task with a vast amount of choice. Look no further…we’re here to make it easier for you with the Toulouse White Painted Blanket box. 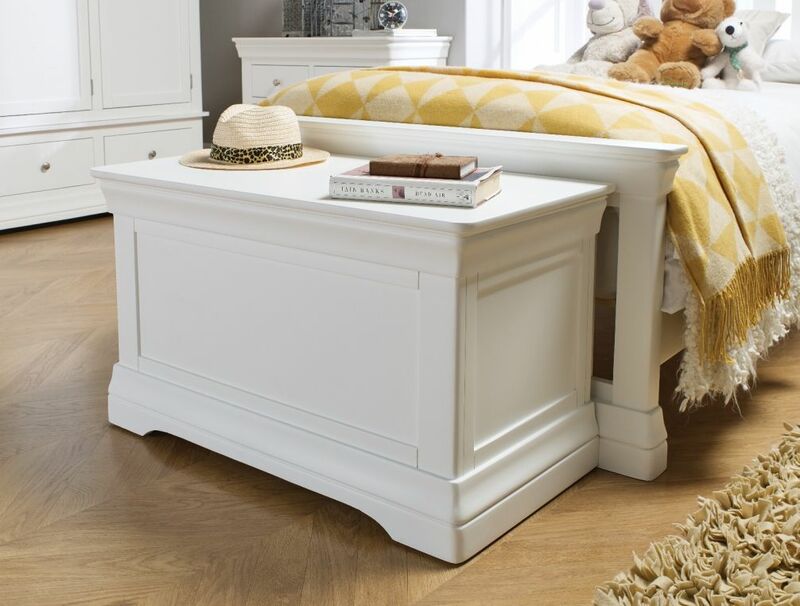 There are a number of reasons why we are confident this white painted blanket box will tick all the boxes. 2. Has a spacious storage area, which is 79cm long, 37cm wide & 37cm deep. 5. Do you loathe flat pack furniture? Don’t worry…you can sit back…we deliver our blanket boxes entirely assembled. Simply unbox and kick-off the use of your blanket box in style. 6. We use the strongest of all joints, the mortise and tenon on all joins, which is then glued to ensure it will hold together under pressure. 7. We use “chrome” hinges on this blanket box, which is an easy to clean, shiny, durable hinge which is “soft close” so cannot slam shut on any fingers. 8. 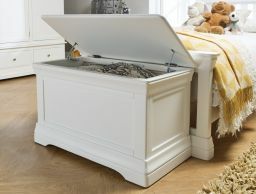 This blanket box is multi-functional and can not only be used as a blanket box but can also be used to store kiddie’s toys and other household items. Overall Dimensions – The blanket box is 90cm wide, 46.5cm deep and 52cm tall. I’m am blown away with the elegance of this peice. It is stunning and very practical. Absolutely love the slow close hinges so little ones don’t trap their hands. Fabulous quality and the customer service is second to non. Fabulous!